Yesterday I spent $100 trying to save a $5 fish. We have a large tank/terrarium which has green tree frogs in the top half and a couple of fish in the bottom half. Ostensibly they are for bio-control in case the frogs decide to make four-hundred babies. The fish eat the frog eggs before they’re fertilised and they also clean up the frog poo when it splashes down. It’s a win-win. But given they’re the aquatic equivalent of working-dogs for us, I hadn’t expected to feel such a strong level of responsibility for them. Until one of them got sick. Really very sick. He disappeared for a day or so and when he appeared out from under the frogs’ island he was missing most of his tail and fins and having trouble staying upright. This fish cost us $5, but I found myself incapable of leaving it to be eaten by the other fish (yeah, nature is cruel as well as pragmatic) or taking it out and euthanizing it. Death by freezer. So $100, a hasty hospital tank and several days later, our little fish euthanized itself. The shock of whatever took its fins and the relentless handling of us trying desperately to keep the fish upright took their toll. But not before we got really creative with our fish-prop devices, finally taking the shape of a sling to keep the fish upright in the water while he healed. None of it worked. But I faced this with my guinea-pig, too, when the vets said we should euthanize that rather than spend $400 making him better. ‘It’s just a rodent’, he said. To me, a pet is more than the sum of its parts. A pet is a responsibility, and an obligation, and a statement about the person you are. It’s a creature you share your space with and expend your energy on. How you treat it in life and in death, matters. Am I the kind of person that would let a living creature die to save $100? I have a friend who spent $20,000 over several weeks trying to save her dog. In the end the dog just wasn’t strong enough to battle the massive infection raging through his body. So they were $20K down and they lost him anyway. Did they regret their choice? No. Obviously they’d rather not have spent $20K on a dog that wasn’t going to make it, but they know they did absolutely everything they could to give him a chance. He cost them $1K a decade before and they spent twenty times that trying to save his life. My fish cost me $5 and I did the same. 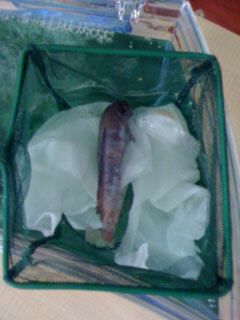 RIP little fish. We may not have given you a name, but I hope we gave you a more comfortable end.